As a fan of the Tan Hill Inn, welcome to our regular newsletter, keeping you informed on all the latest happenings from the worlds famous highest Pub in Britain. The Tan Hill Inn is a historic place steeped in tradition, dating back to the 17th century, a lonely site high in the Yorkshire Dales. While we are Britain's highest pub at 1,732 feet (528m) above sea level, we have discovered this magical new age service called t'internet. So we are happy to report launching our brand new online booking system, you can now check to see if we have availability and book online with just a few clicks.. book or check availability online > or do it the old fashioned way and give us a call on 01833 62 82 46. 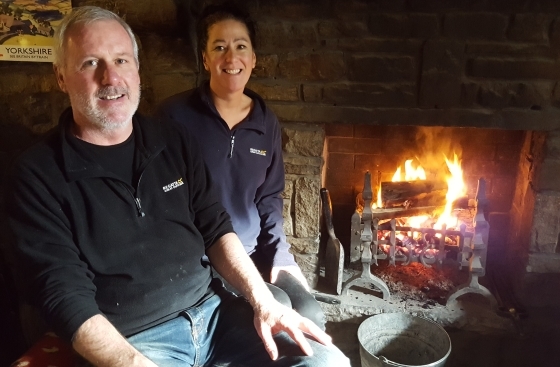 Louise & Mike (Tan Hill Inn Owners) are excited to announce the appointment of our new Managers, Vanessa & Nigel, who officially got to work on Tuesday 1st November. I am sure all our regular TanHillers will, like us, wish them all the success in the world taking on the tough job of managing Tan Hill Inn. Find out Vanessa's, our new manager thoughts of how they're settling in..
After our first week at Tan Hill it has been an experience to say the least. It is so surreal it feels like I am in a full-time movie. We have had highs and lows this week and yet we are still up for this magnificent challenge. Vanessa & Nigel enjoying the Tan Hill Inn's welcoming fire. I have driven a snow plough for the first time in my life and now realise that I am a truly a dumb brunette!!!! I expected Sunday to be a rather quite day, however people were coming in droves from off the moors. I even managed to employ a new bar/events assistant Isabella. We wish all customers old and new a very merry Christmas and we hope you can join us at Tan Hill over this festive time. Have you booked tickets for our New Year's Eve World Famous Ultimate 2 Night Pub lock-in? Visit our website for more details - tanhillinn.com/venues/new-years or call 01833 62 82 46. Wednesday 21st December 6.30pm until you drop!!! Reader, you can keep an eye on our 'What's On Calendar' or like our 'Facebook Page' to get the latest news for events we have going on at the Tan Hill Inn.